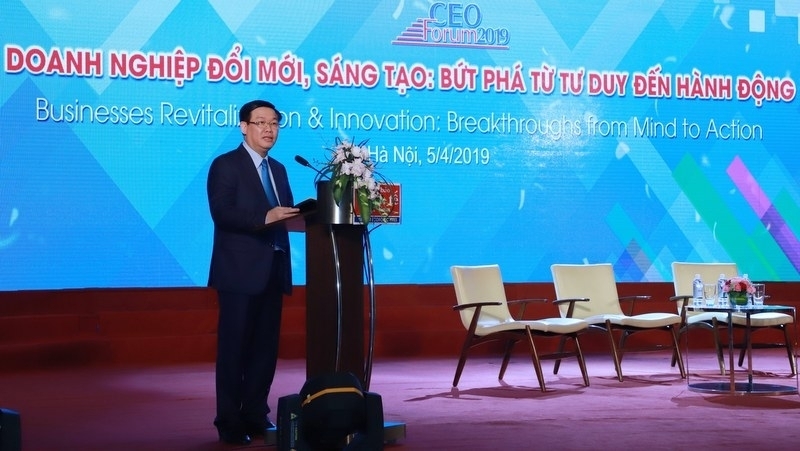 Deputy Prime Minister Vuong Dinh Hue said that each enterprise should be a center of innovation amid the urgent requirements of innovation in mind and action. The Government official made the remarks while attending the “Business Revitalisation and Innovation: Breakthroughs from Mind to Action” CEO Forum 2019 held on April 5. Addressing the forum, Deputy PM Hue affirmed that the Party and State advocate the transformation of growth models based on the application of science and technology and innovation in order to improve the productivity, quality and competitiveness of the economy. The government has increasingly improved the business environment and strengthened the macroeconomic foundation, in addition to promoting the start-up ecosystem and innovation and creating the most favourable conditions to support enterprises. He emphasised that creating breakthroughs is the message that the Government wants to deliver to all ministries, localities and enterprises to achieve the socio-economic targets in 2019 and the five-year socio-economic development plan in the 2016-2020 period. Enterprises cannot go alone in their process of innovation, thus, the Government is committed to accompany enterprises in such a difficult but promising career, Deputy PM Hue noted. At the discussion session, delegates agreed that, in the context of fierce competition and integration, enterprises must prioritise innovation to stand firm in the market. They should innovate from thinking to action of executives to employees to enhance labour productivity and apply advance technology to operations of enterprises.